Cake Poker no longer accepts Americans. Instead they have opened up Juicy Stakes Poker which is the exact same as Cake - except all the players registered there are ONLY American. If you're an American looking for Cake Poker Rakeback, sign up for Juicy Stakes Poker Rakeback. If you're not an American - you can sign up at Cake. 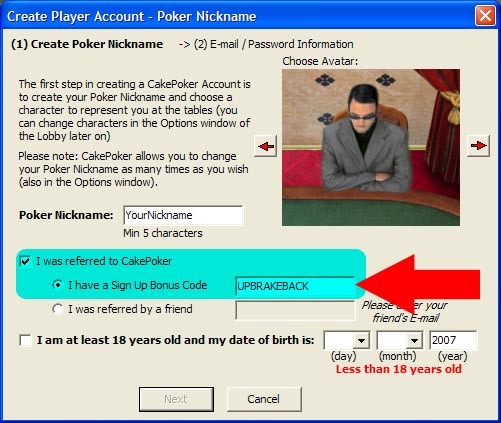 You will recieve the maximum rakeback available at Cake Poker, which is 36%. You can check your rakeback statistics via the Cake Poker client, which is updated in real-time. All rakeback payments are made on a weekly basis, every Wednesday for the previous weeks amount, to your Cake Poker account. Cake Poker uses the "dealt" rake method. Download the software via this link. Install and run the Cake Poker software. Register a new account with bonus code UPBRAKEBACK as demonstrated in this image. Be sure to leave the "I was referred by a friend" field unchecked and blank. We will e-mail you back to confirm that you are tracked okay to Cake Poker, at which point you can deposit into your Cake account. We will also provide you with all additional details about your rakeback. Cake Poker Review: Please note the below review is outdated. As of June 2012 Cake is on the Revolution Network(their own network which they sold to Lock Poker). We will be updating all our reviews soon, but with rumours of a big software update we wish to wait. 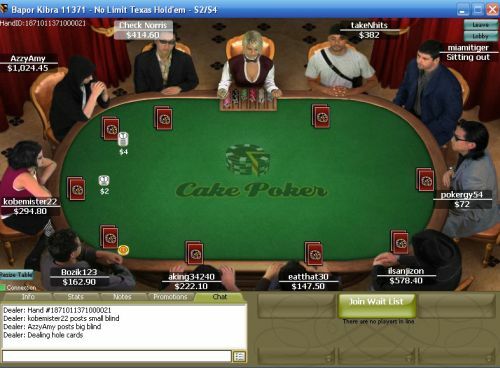 Cake Poker is our most popular poker room for rakeback, and we are one of Cakes biggest rakeback providers, having started working with them as soon as they launched in 2006. Cake Poker are a poker room that accepts US players(except for anyone residing in the state of Kentucky), and along with 33% rakeback, have a 100% to $500 sign-up bonus. Cake Poker also offer a very strong loyalty program with an MMO-style system featuring gold chips and gold cards. Cake also have a great store where you can spend your gold chips on items such as XBox 360s, Ipods, chipsets and even BBQS without it affecting your rakeback in any way. The main reason Cake Poker is so popular, is due to the fact that the players there are usually a lot worse than at most other online poker rooms, helping you increase your winrate. This is a combination of Cakes loyalty program appealing to the "fish", as well as Cake opening up their network to allow sportsbooks to share the playerbase, who are notorious for bad poker players. Cake Poker is also not compatible with Pokertracker which is actually a huge positive as it means there is a lot less multi-tabling tight-aggressive players. You can sign up for Cake Poker Rakeback here.